Imagine wearing gloves for the entire day, from the moment you leave your house until you return again late in the evening. Do you think your hands will be affected, especially if you choose stiff gloves that really limit your movement? Have you ever worn a cast due a broken bone or other injury? What happens to those muscles in the cast? They wear away and become tremendously weaker! This is what is happening everyday to your feet due to shoes. Shoes are a cast! This does not mean we should be barefoot all day either. But we absolutely need to pay more attention to these vital components to our athletic performance and overall health. Almost any athletic endeavor you do will start at the feet. 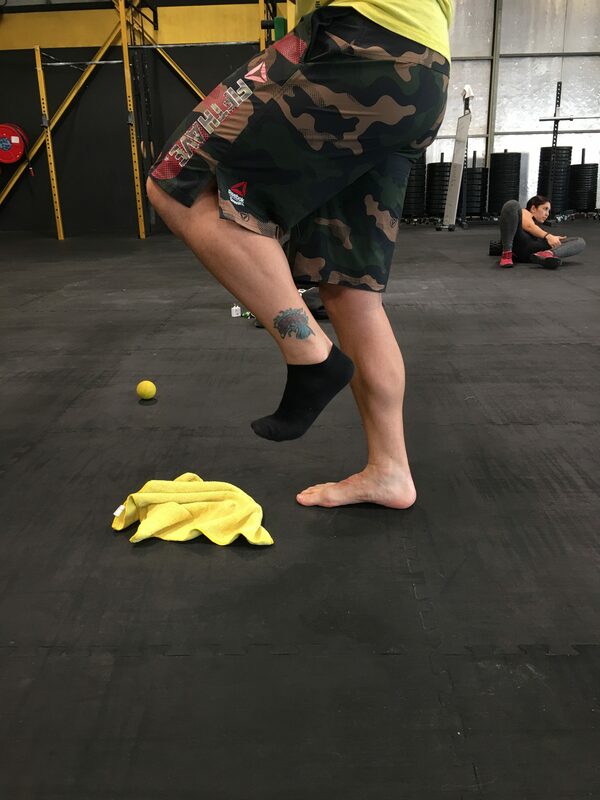 The main foci of this site (Olympic weightlifting, functional fitness, powerlifting, strongman) require you to be able to generate power through the ground and transfer it upwards. Do not leave that extra 1-5% of performance on the table by ignoring your feet, and worse yet, do not allow a collapsing and weak arch in your foot allow pressure to travel up to your knee/hip/back with each rep and lead to your demise. But the more days you can address this the better. Also, consider going barefoot whenever you can – around the home, around the gym if it (and your feet) are “clean enough” – that can mean many different things to many different people. 1. Single leg stance – 1 minute per leg. Start with static stance. Once this is easy, add in tossing a ball to a partner or against the wall. Super challenging version of this drill is with eyes closed as vision is a huge part of balance. 2. Self myofacial tissue release of the bottom of the foot – 1 minute per side. A lacrosse ball provides an incredible massage, as can a tennis ball or golf ball. Mix it up, find what works, but address this area! 3. Towel or t-shirt crunch – think of this one as sit-ups for your foot muscles. Flex that arch! Show it off, build it up, just like biceps curls. Cramps are possible as you build these muscles up but have patience and know that you are doing your body a huge favor by waking these guys up. 30 seconds on each foot will help really build these puppies up.